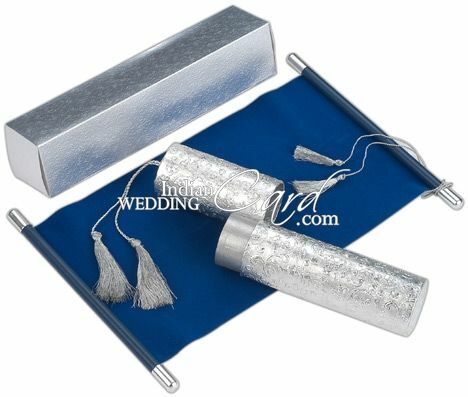 S115, Blue Color, Scroll Invitations, Jewish Invitations, Box Scrolls, High End Scrolls, Fabric Scrolls. Truly regal and unique, this Scroll card is the epitome of classic design. The scroll card has been exclusively designed in blue velvet cloth with silver bars providing the frame. 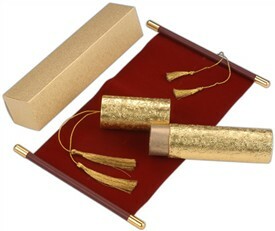 The Scroll card is encased in a very attractive silver embroidered paper container case with the golden tassel. The silver box envelope finishes the overall composition.